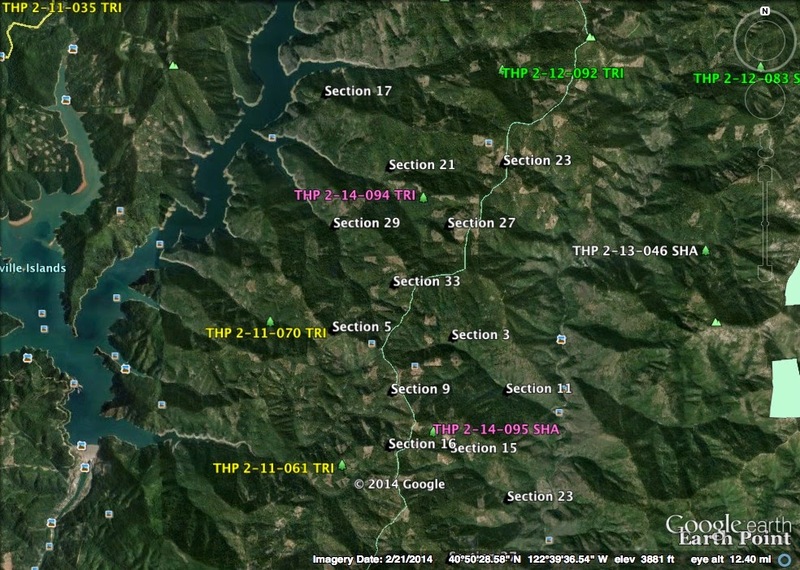 THPBlog: Sierra Pacific Industries planning a pair of clearcut THPs east of Trinity Lake. Sierra Pacific Industries planning a pair of clearcut THPs east of Trinity Lake. This THP is about 3 miles east of Trinity Lake at an elevation of 2,400 to 4,400 feet. Sierra Pacific Industries is planning a mostly clearcut tractor and cable logging operation in Douglas fir, ponderosa pine, sugar pine, incense cedar and white fir forests. Over 7 miles of new road construction is proposed to access units, and ground based equipment is planned for use in areas designated for cable logging inside units 33A and 21D. Tractors are proposed for use on steep slopes over 65% grade to construct skid trails inside units 27D and 29Z, and on slopes over 50% grade that do not flatten before reaching a watercourse in units 5A, 21E and 21F. 23 road drainage sites are planned for work including rocking, dip construction and culvert repair/replacement. There is a bald eagle nest nearby at Clawton Gulch at Trinity Lake. For spotted owl site TRI301, this THP will remove 24 acres of foraging habitat within .5 mi. and 53 acres of foraging habitat within .7 mi; for spotted owl site SHA0074, this THP will remove 18 acres of foraging habitat within 1.3 mi; for spotted owl site SHA0107; this THP will remove 35 acres of foraging habitat within 1.3 mi; for spotted owl site TRI0321; this THP will remove 13 acres of foraging habitat within 1.3 mi; for spotted owl site TRI0392; this THP will remove 42 acres of foraging habitat within .7 mi; and 79 acres of foraging habitat within 1.3 mi. This THP is just north of SPI’s Whitney Gulch THP 2-14-095 SHA. This THP is about 4 miles east of Trinity Lake at an elevation of 2,000 to 3,600 feet. Sierra Pacific Industries is planning a clearcut tractor and cable logging operation in Douglas fir, ponderosa pine, sugar pine and incense cedar forests. Tractors are proposed for use on steep slopes over 50% grade that do not flatten before reaching a watercourse. There is a goshawk territory within .3 mi of the THP area in section 34, and klamath mountain catchfly was found in unit 9C. For spotted owl nesting territory SHA0074; this THP will remove 19 acres of foraging habitat within .7 mi, and 17 acres of nesting/roosting habitat within 1.3 mi; for spotted owl nesting territory SHA0121; this THP will remove 17 acres of nesting/roosting habitat within .7 mi, and 116 acres of foraging habitat within .7 mi. This THP is just south of SPI’s Van Go THP 2-14-094 TRI. More information is available on the THP Tracking Center website.